For You Are a Kenyan Child! Download now for only $12.95! Click here to download! You are a boy in a Kenyan village. You wake up and eat breakfast and then go out to watch your grandfather's cattle. You think that it won't hurt to go into the village to see who is up. So, you go from hut to hut, visiting. Have you forgotten about your job? What will happen when you finally remember your responsibility and find that the cattle are gone? is part of a collection of 42 units in Reading Seeds. Buy For You Are a Kenyan Child by Kelly Cunnane. 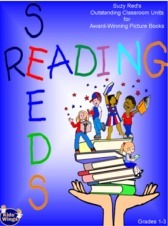 It is one of the 42 literature guides in our Reading Seeds collection. for $.59! Order now while quantities last! Special Thanks to Claude Ciari allowing us to use his beautiful original composition, "Africa." Visit his website at http://www.ciari.com!